The KiraVan® Expedition System is comprised of a highly modified Unimog-based tractor, a fully custom composite trailer, and turbo-diesel motorbike. It supports a crew of three for on & off-road operations, with a significant compliment of custom advanced Glass-Cockpit, Driveline, Suspension, Hydraulics, Power, COMMS, NAV, Electro-Optical and scientific technology. 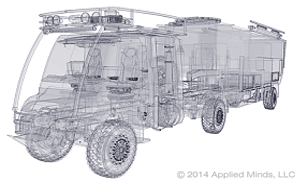 It is an ongoing advanced vehicle R&D program designed and integrated by Applied Minds, LLC. 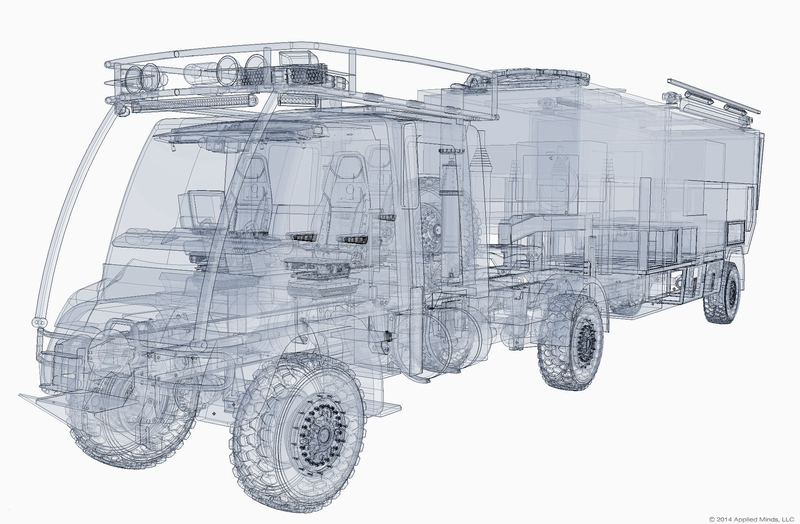 Preliminary conceptual work on the KiraVan™ began in 2010 as a natural follow on to the original MaxiMog® expedition system. After 15 years, it was time for something creatively new that reflects what is technically possible now and benefits from what we learned. Not coincidentally, the timing of this activity was also triggered by the arrival of our wonderful daughter, Kira, and the realization that accommodating the needs and safety of a child presents many new design considerations. This new design benefits from the accumulated experience of the original MaxiMog project, which was built to our specifications by UNICAT in Germany, as well as the work of other excellent design teams and companies. The intent of the KiraVan is to create a superior large-scale expedition system for over-land exploration, still photography, film production, scientific research, and with which to show my daughter seldom visited places of unspoiled natural beauty. As compared to the MaxiMog, the principal design goals were to increase the available space and capabilities, extend flexibility and modularity, minimize crew workload while increasing their situational awareness, and minimize negative environmental impact. Further, to maximize the “ilities” – reliability, maintainability, survivability, and overall supportability of the final product – while enhancing passenger safety. 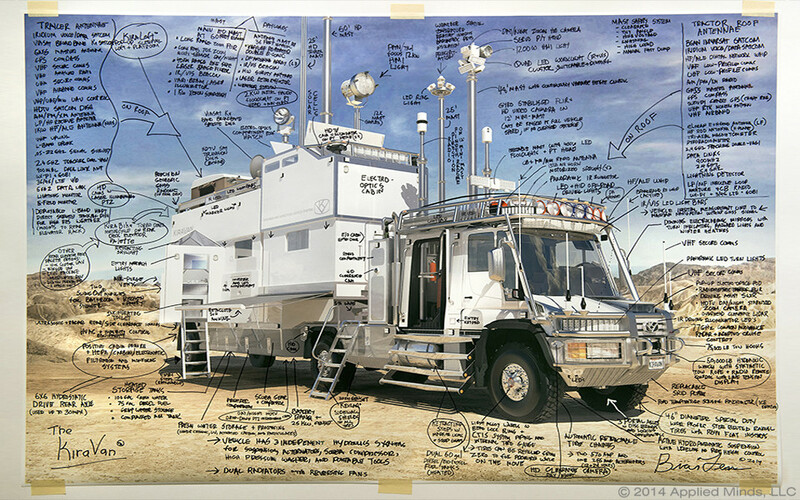 And finally, the intent has been to make this expedition vehicle more “kid friendly” and give Kira places to work, play, interact (often remotely) with her friends, and do her own personal research and discovery. For a variety of reasons, starting again with a well-established truck chassis has much appeal, compared to building the entire vehicle from the ground up. Beyond cost and schedule, this approach allows one to build upon the success of a mobility platform with a proven track record and greatly simplifies licensing for use worldwide. The final design consists of a tractor-trailer configuration. Specifically optimized for extended off-road capability as well as over-highway travel. Also carried at all times is the KiraBike turbo-diesel motorcycle which is located on an elevator system at the rear of the trailer. The KiraVan also carries a significant compliment of specialized technology used for communications; telepresence; navigation; mapping; still, film, and video production; remote exploration; physical and chemical analysis; geology; archaeological survey work and digs; scientific field research, and thorough trip documentation. TRACTOR – The tractor is a modified Mercedes-Benz Unimog U500NA with a Mercedes-Benz 6-cylinder in-line 260HP high-efficiency intercooled turbo-diesel engine providing 700ft-lb of torque. The chassis frame has been stretched and reinforced, a four-door composite crew cabin added, and an off-road articulating fifth-wheel trailer hitch attached. SIZE AND WEIGHT – The combined length of the KiraVan tractor and trailer is 52’ (with the motorbike mounted on its carrier elevator). The maximum gross vehicle weight is 51,700 lbs. with an off-highway limit of 42,500 lbs. EXPEDITION ENDURANCE – The 170 US gallon diesel and/or bio-diesel fuel supply can provide up to a 2000 mile driving range over average terrain. Enough food, water, and expendables are carried to support the crew of 3 people for 3 weeks without re-provisioning. The fuel system and tanks are heated for extreme cold and bio-fuel use and incorporate extensive filtration capabilities. TECHNICAL POWER SYSTEMS – Twin, hushed 25kW diesel engines and two modular high-current battery banks with static inverters and UPS systems provide technical power. A solar battery charging system complements two 570 amp and one 285 amp alternators. The battery banks reside in sealed stainless steel housings, with integrated charge state monitors and winter heaters. There are also two shore power connections for use when external power is available. COMPUTERS AND NETWORKS – An extensive selection of embedded, server, and portable computers communicate over multiple wired and wireless data networks to host the vehicle control systems and a wide variety of software programs and applications. Wireless satellite broadband (available most places on earth) provides a maximum 5Mbps uplink and 10Mbps downlink. POSITION, NAVIGATION, AND TIMING SYSTEMS – A series of GNSS receivers (GPS, GLONASS, Galileo, and BeiDou frequency compatible) provide time and frequency correction information to the onboard rubidium frequency standards, as well as precision 3D location information. When no GNSS signals are receivable, an onboard inertial measurement unit (IMU) employing precision accelerometers and fiber optic gyros maintains position, course, and velocity knowledge. 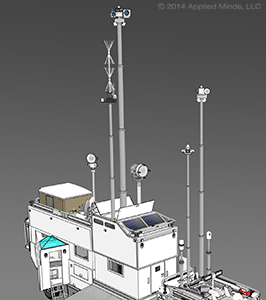 SECURE VOICE AND DATA COMMUNICATIONS – The KiraVan has multiple communications systems for voice and data, designed to support local line of sight (LOS) and global communications everywhere on earth. This includes difficult locations such as remote canyons, triple-canopy rain forests, and polar regions where traditional satellite communication is ineffective. All voice and data traffic may be encrypted except on amateur radio bands. The vehicle and radio operators are licensed for operation on both commercial and amateur bands, as well as for communication with aircraft for local filming and mission coordination. AIR CONDITIONING AND HEATING – The HVAC system, with independent humidification and independent dehumidification, can maintain comfortable cabin temperatures at outside air temperatures (OAT) ranging from -30º to +130ºF. Under most conditions, the crew-cabin HVAC and technical equipment can operate for 10 hours (heating or air-conditioning on battery power) without reliance on the main engine or gensets. FIRE PROTECTION AND SECURITY SYSTEMS – The vehicles are continuously monitored for heat, smoke, combustion byproducts, and for direct flame by UV/IR flame detectors. Automatic aqueous foam fire extinguishers are provided for each engine (but may also be discharged manually), and Halotron extinguishers are accessible in the cabins and technical areas. The vehicle also incorporates a comprehensive security system, including remote vehicle tracking. WATER SYSTEMS – The vehicle offers 150 gallons of fresh water storage capacity and on-board particulate, ceramic silver anti-microbial, activated carbon, and Ultra Violet filteration systems. When new water is taken on, it is pre-filtered, and salt water may be desalinized by a reverse-osmosis filtration system carried when needed. EMERGENCY AND MEDICAL EQUIPMENT – A complete expedition medical kit is carried, with diagnostic equipment (patient monitor and ultrasound), AED, first aid, and OTC and prescription drugs tailored for the expedition members and anticipated travel conditions. MAST SYSTEMS – Both the tractor and trailer have multiple servo-controlled pneumatic masts with continuous height control. The tallest mast places the Electro-Optical package 58’ above ground level and has a payload capacity of 250lbs. The two mini-masts integrated into the Tractor rear cabin have heights of 22’, a payload of 50lbs each, and may be operated when the vehicle is at speed (in off-road areas with no overhead obstructions). All masts and payload packages incorporate heaters for extreme winter icing conditions. PHOTOGRAPHIC IMAGING AND DOCUMENTATION – The mast based Electro-Optical (EO) systems allow for high definition imaging in the immediate proximity of the vehicles or at substantial distance. Long-range optics provide views with visible, FLIR, and intensified night vision imagers. A bore sighted eye-safe laser rangefinder on the EO mast provides precision range of up to 40km to a reflective object. The EO system may be used to capture still images or film (plus location data) or may be used to automatically generate gigabit panoramas. Portable video and still imaging gear is also always carried. SITE SURVEY AND MAPPING – A complete GIS survey and mapping suite, along with the Electro-Optical systems and portable survey gear, permits thorough photo-documentation (still or video) of a site (such as an archaeological dig) with centimeter precision. Local or remote map databases may be used and ortho-rectified as needed. 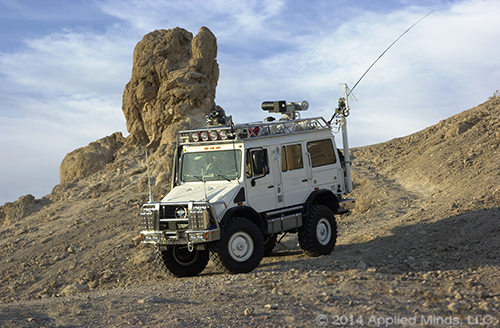 A laser total station and an RTK-capable rover GPS are always carried. RADIO FREQUENCY SIGNAL SURVEY – A series of high-performance receivers and software-defined radios (SDR’s), all under computer control, cover the spectrum from 10kHz to 22GHz. These systems provide spectrum analysis and station identification from multiple global frequencies databases. A computer-based DSP modulation analysis capability is available for any receiver source, and all receivers are phase-locked. Stationary or on-the-move VHF and UHF radio direction finding is available on both vehicles, with linked extended baseline capability when the vehicles are separated. INTERCOMS AND VIDEOCONFERENCING – Each vehicle has provisions for telepresence on the move, as well as integrated communications between all vehicles and outside parties. Connectivity is via SATCOM or terrestrial data networks to the Internet. REMOTE UAV/UGV/USV VEHICLE CONTROL AND TELEMETRY – Both vehicles have the ability to remotely control land, sea, or air vehicles. The command and control link is at UHF frequencies with return telemetry and two channels of high definition video at S-band. The command signals are radiated at high power by a 360º double bi-conic array, and return telemetry is received by both auto-tracking Yagi and omni-directional antennas.